The role of images in shaping cultures is widely acknowledged. Less probed is the question of what makes images efficacious in the first place? The conference explored the mechanism and processes through which cultural convictions and conventions animate static images in Chinese history and society. Issues that were discussed included ways of perceptual projection, symbolic investment, rhetorical amplification, generic inflection, properties of medium, visualization and visionary embodiment, technological innovation, sociopolitical manipulation of public images, and ritual use of visual images. View the conference poster and the conference agenda. Date: 27 September, 2008 1:00 p.m.- 5:00 p.m.
"East Asia as the Sinographic sphere"
"The Foundation of Literate Culture in Early East Asia: Learning from Dictionaries and Categorized Encyclopedias"
The Harvard Yenching Institute hosted a symposium on "Historical Dialogue and Reconciliation in East Asia: Recent Practice and Future Prospects" on September 12-13, 2008. The symposium was organized by Professors Andrew Gordon and Hiroshi Mitani. Professor Mitani, of Tokyo University, is a historian of Japan and was in residence at the Harvard-Yenching Institute in 2008. Professor Gordon is a historian of Japan on the Harvard faculty. In both East Asia and America, the idea of the university and the role of the humanities and social sciences is increasingly a topic of discussion. To that end, Dean Emeritus Henry Rosovsky and Professor TU Weiming, Director of the Harvard-Yenching Institute, organized a structured conversation regarding the role of the humanities and social sciences in higher education in leading East Asian universities, held under the sponsorship of the Harvard-Yenching Institute. The participants represented seven regions in East Asia (Japan, Korea, China, Taiwan, Hong Kong, Vietnam and Singapore) and the United States. 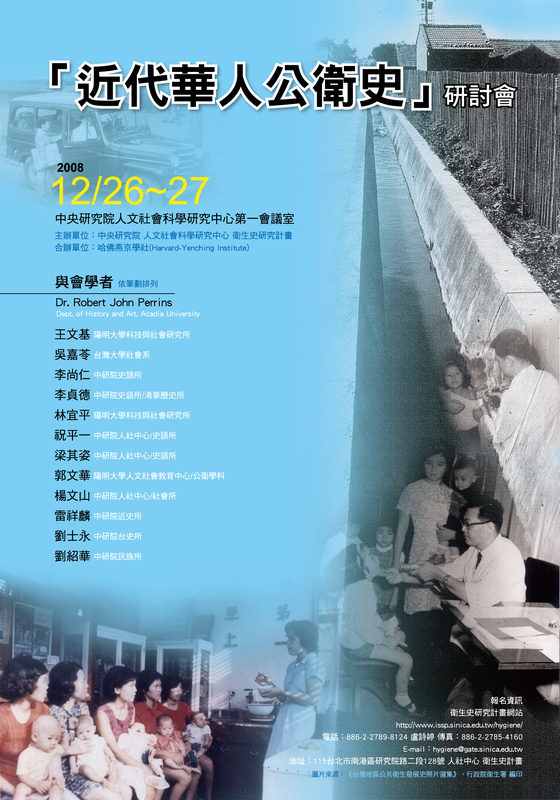 An International Symposium sponsored by the Harvard-Yenching Institute. The program is available. The international conference "Reviewing the Past, Projecting the Future - Harvard-Yenching Institute's Contributions to the Advancement of the Humanities and Social Sciences" was held at Harvard University from June 2-4, 2006. The conference provided an opportunity for Harvard-Yenching Institute Doctoral Scholarship Grantees (former doctoral grantees with a doctoral degree and currently funded doctoral students), Visiting Scholars and Fellows to present their scholarly works at Harvard University, and to generate new scholarly interaction among them. The conference also offered a chance to review the Institute's accomplishments in the past decades in promoting the development of the humanities and social sciences in East and Southeast Asia. The conference had five panels (see below for details) which were held simultaneously in five seminar rooms at the newly constructed Center for Government and International Studies (CGIS) Buildings. A copy of the program is available. The Harvard-Yenching Institute Alumni Association, PRC Branch, held the 6th Biennial Conference of the the Harvard-Yenching Institute Forum "Cultural Awareness & Cultural Identity: East Asian Perspectives" from September 22-25. Sponsorship for the Forum includes Nanjing University, Harvard-Yenching Institute, Harvard-Yenching Alumni Association (Mainland China), and the Suzhou Industrial Park Administration Committee. In order to examine Vietnamese literature as an object taking shape and developing within circumstances influenced by internal and external factors, as well as to consider current states of the field of Vietnamese literature studies, and create a forum for scholarly exchanges between Vietnamese and international researchers, the Institute of Literature and Harvard-Yenching Institute co-organized an international conference entitled Vietnamese Literature in the Regional and International Context of Cultural Exchanges. This two-day conference was held in Hanoi from November 3-4 2006. The evaluation of the achievements of Vietnamese literature after 20 years of Doi moi ("Renovation" or "Changing for the New") is now attracting a great interest from researchers in the fields of literary theory, criticism, and creative writing. It also draws a significant attention from the Vietnamese and international public. This panel will not only evaluate Doi moi literature's achievements, but also examine its current states, projecting its future, appraising its capacity to engage itself with regional and international literature, and examining its national identity in the context of globalization. Experiences drawn from the development of the Doi moi literature during the last 20 years also need to be revisited. Especially in this panel Vietnamese literature scholars expect to receive novel insights from their non-Vietnamese colleagues, considering them outside observations and critical thoughts that are needed to move toward more comprehensive and rational evaluations of current states and prospects of Vietnamese literature. Traditionally, the relationship between literature and culture can be described as that of a component and an assembly to which it belongs ("culture" hereby covers the way of life, including knowledge, arts, beliefs, social conventions, or customs). Their relationship can also be envisioned as that of a component and the others in the assembly. The nature of these relationships can be characterized as interactive and multi-dimensional. The study of Vietnamese literature in relation with national culture and its dynamics has attained significant achievements. In addition to new and profound studies conducted in this direction and based on recent attainments of social sciences and the humanities, this panel expects that the study on the relationship between literature and culture will be considered in a broader scope. Vietnamese literature (past and present) should be regarded as a component of regional and global culture. Starting from this basis, national identity and humanity in (Vietnamese) literature can be examined with novel insights and from multiple perspectives. Chronologically, literary Vietnamese translation employed two scripts: the Nom (starting circa 15th century) and the Quoc ngu (since the end of 19th century and the beginning of the 20th century). It covers a wide array of types, ranging from retelling, sketching, or plot borrowing to modern translation. Due to the conditions and particular capacities of the structure of the language and the scripts through historical periods, Nom and Quoc ngu translations have different contributions to the development of literature of the nation. In comparison with its Nom counterpart, Quoc ngu translation has occupied a more noticeable position. Translated literature, as a channel to introduce foreign literary and cultural values to a nation and simultaneously a conscious but also arbitrary choice of the native, has changed through times under the effects of specific historical, cultural and social factors. It provides new topics and motifs, adding new ways of representation, and consequently changing writing styles and transforming existing concepts, predilections, aesthetic necessities, and most importantly, improving the nation's literature and language. Viewed from another perspective, translated literature is the basis to understand the transition and transformation of values from one culture to another, apprehending national characteristics in the process of interacting with other cultures, and comprehending the internal demands of the national literature. Besides the requirements of recoveries of old literary texts, the study of Vietnamese translated literature through times also needs new interdisciplinary, transcultural and transnational approaches. This panel expects to receive papers relevant to the above issues. Papers contributed to this panel may also have other approaches to emphasize the role of translation in the history of Vietnamese literature. At the beginning of the formation of written literature, oral literature and written literature were closely related to one another. Their relationship took place on the basis of mutual effects, and its characteristics might vary from one to another period. The compilation and textualization of oral literature as well as works imitative of and created from literary materials of oral literature can be regarded as one direction of influence. Another direction can be found in the circulation of written literary works composed in the style of oral literature, with various textual changes randomly made by circulators, in elements borrowed from written literature and applied in oral literature; or in the introduction of historical authors and heroes into folk literature and beliefs. These two directions coexist and mutually affect one another. In Vietnam, when problems of manuscript culture have not yet been considered thoroughly, results and consequences of the mutual effects between oral and written literatures still require researchers to pay special attention to the study of authors, their works and their cultural environment, as well as the history of oral and written literature. This panel hopes to receive papers based on careful investigation and verification of texts and field studies to understand and interpret the interacting relationship between oral and written literatures. Literature also has interacting relationship with other arts. Literary works can be inspirational sources, which have deep influence on fine arts works or on works of performance arts, and vice versa. When the notion of "text" is not limited within written or printed literary works, the connotation of the act of "reading" is also open toward other products of the arts, such as sculpture, painting, or music. Intertextuality allows us to "read" out interarts elements implanted in literature and the arts. Here we can see the response of the reader who plays the role of the subject in the readerly creative process in a specific type of literature or the arts. The panel welcomes papers on films and plays as written literary texts (film or play scripts) and as performance art products; and on the relationship between literature and fine arts (especially with paintings and sculptures inspiring or inspired by literary works). Papers presented in this panel can also investigate the interacting relationship between literature and the arts from a diversity of perspectives beyond the above suggestions.